Probably first built in the 1860s by Thomas Bard and Thomas Scott as a small redwood cabin with a basement, the Ranch House was transformed into a 4,000-square-foot, two-story Victorian mansion following the 1875 purchase of the Rancho San Francisco by Henry Mayo Newhall. The home was used as lodgings for Newhall family members, particularly Henry Mayo's eldest son Henry Gregory, who died in 1903. After 1906, it became the ranch foreman's residence and was occupied until 1973. Originally located at Castaic Junction, the Ranch House was moved to Heritage Junction in August, 1990. 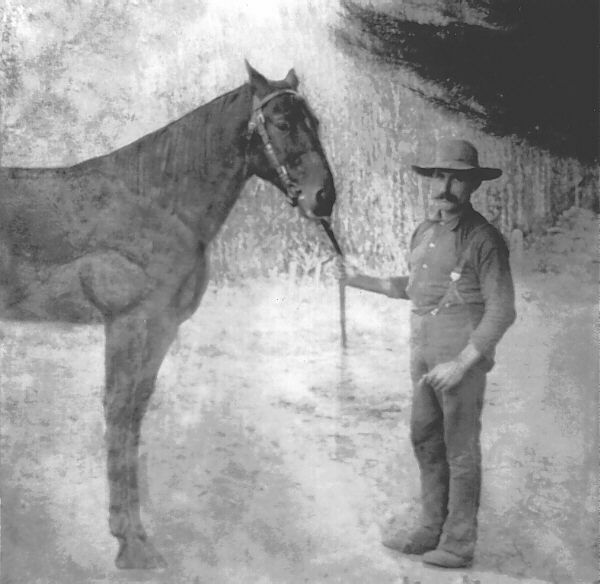 Photograph found inside a wall of the Newhall Ranch House. This image has been digitally reconstructed. Identification by Jerry Reynolds and Pat Saletore.